One of France's most uniquely compelling artists, Bernar Venet has devoted the last two decades to an investigation of meaning and form in sculpture. Venet was trained as a painter but quickly became involved with conceptual art, experimenting with mathematical and aesthetic principles in a variety of media, particularly sculpture. 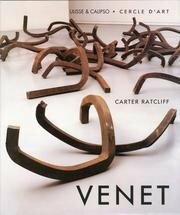 In this illustrated book, critic Carter Ratcliff provides an illuminating look at the complex relationship between form, language, and meaning in Venet's recent work. Thierry Lenain is professor of art history at Universite Libre in Brussels. Thomas McEvilley is professor of art history at Rice University in Texas.